Oso is an energetic chocolate labrador retriever with KCSD and NSDA airscent certification who is also certified in human remains detection. Respected by dogs and feared by dog owners for his ability to open door handles, Oso was named in memory of the 2014 Oso WA mudslide where Heather and her previous search dog, a yellow lab named Tryon, worked. Heather has been a member of KCSD since 1997 in many roles including President, Training Chair, and as an Operational Leader. 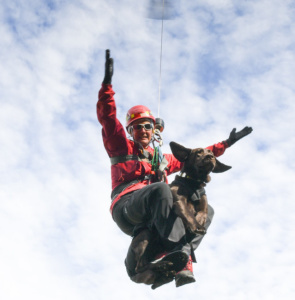 She has contributed to hundreds of searches throughout Washington, has led workshops in different K9 search disciplines, taught classes at the annual WA State SAR conference, and is a Principal Evaluator for the National Search Dog Alliance (NSDA). Over the past few years she has also traveled to Japan with Andy Rebmann and Marcy Koenig to help teach search dog workshops for the Japanese handlers and recently helped train search dogs in New Zealand with Josh Gerstman.